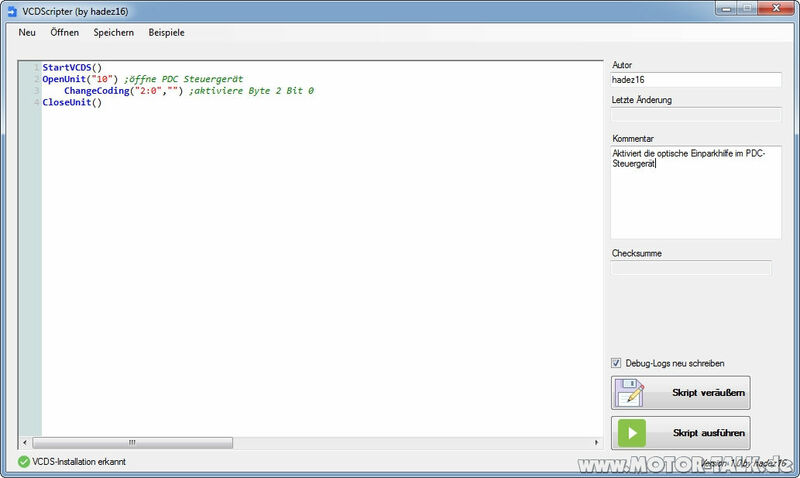 The application VCDScripter is a tool for automating steps in Ross-Tech (LLC) VCDS® (later on mentioned as “VCDS”). For this purpose a script language is introduced that automates user steps within the VCDS application. How does it work and where can I download it? Hadez16, the author of the VCDScripter, is neither affiliated with Ross-Tech (LLC), nor focusing any commercial intention. As beinga private project the quality of VCDScripter may not be related to any quality of Ross-Tech VCDS®. Do you like the VCDScripter? Visit the PayPal.Me Website of hadez16 and donate a small amount for his great work!